Quilting people can do anything. We really can. Measure, measure, measure….cut, cut, cut…change the shape and put it all together again. Today we had new flooring installed in our kitchen, following a plumbing disaster which ruined the old floor. We have a closet in our kitchen which I call the “pantry” and my husband calls the “larder.” We forgot to order enough flooring to include the pantry, so the fitter said he would try if he had a large enough piece left over. Well, he didn’t. 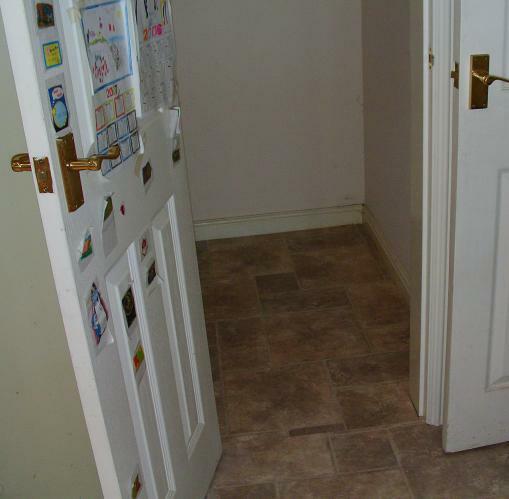 After he left, I went to tidy up the scraps and rubbish, and I found a large piece of flooring that was very long and only less than 1 inch too narrow for the pantry floor. Not large enough for a professional floor fitter, but I decided to give it a go. I used my husband’s Stanley knife and my quilting ruler and thick green mat, and I cut that piece of flooring to fit the cupboard and around the door facings, and I centered it in the space so there is only 3/8 inch gap on each side. The gaps are barely noticeable, and when I get my shelf units back in, no one will ever know. I secured the flooring with lots of strips of double-sided sticky tape, and it’s staying in place and looks wonderful, and everything matches now. Me too, I went through a stint at making my own Scrapbooks and found that a stanley knife or craft knife was useless and left rough edges. My rotary cutter, quilting ruler and mat came in very handy… the cutter goes through 1/8in book board and card like butter with lovely smooth, accurate edges. Granted, it did eventually blunt my blade and I had to buy some new ones, but it was very handy to use at the time. My husband used to use my rotary cutter to cut a plastic film material that was the sheathing for his radio controlled model airplanes. Much easier and more accurate than scissors.